The subcompact Ford EcoSport crossover, which next year will join the US market for the first time, has secured a spot in the upcoming film Guardians of the Galaxy Vol. 2 from Marvel Studios. “Teaming up with Marvel is a perfect way to share how EcoSport turns every drive into a chance to live big, enabling our Earth-bound customers to experience as many adventures as Guardians of the Galaxy offers,” says Ford’s Executive Director of US Marketing, Chantel Lenard. 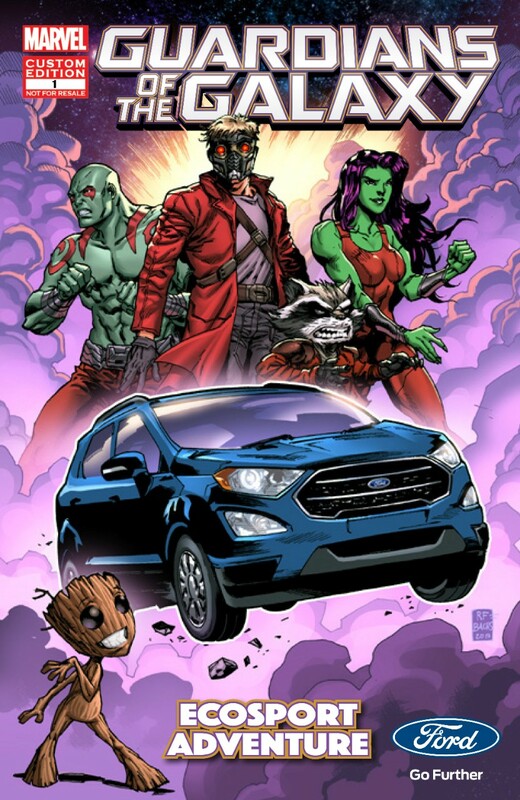 The Ford EcoSport / Guardians tie-in stretches further than just the film, with a limited, 500-print comic book featuring the crossover also planned. Fans can also enter to win the “Be the Guardian of Your Galaxy” sweepstakes at the Marvel website, with prizes including a hometown screening of the new film, one of 150 custom illustrations from a Marvel artist where the fan is drawn as the hero, and of course, a brand-new Ford EcoSport. Guardians of the Galaxy Vol. 2 hits theaters on May 5th. We look forward to seeing just how naturally the pint-sized crossover can be worked into the story.